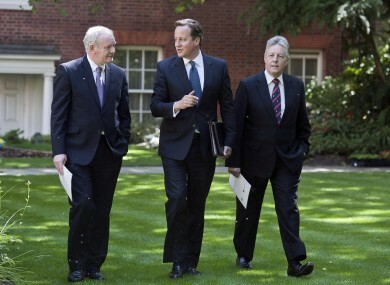 Prime Minister David Cameron walks with Northern Ireland's Deputy First Minister Martin McGuinness and Northern Ireland's First Minister Peter Robinson earlier in the garden of 10 Downing Street in central London. NORTHERN IRELAND HAS received an economic aid package from the UK to help its struggling economy. The British Prime Minister David Cameron met with Northern Ireland’s Deputy First Minister Martin McGuinness and Northern Ireland’s First Minister Peter Robinson to announce the economic pact in the garden of 10 Downing Street in central London earlier today. The package includes an investment plan, enhanced capital borrowing powers and government top-ups to EU peace initiatives and structural funding. The package includes £20 million to be spent on research and innovation – focusing on the aerospace industry and an additional £100 million in borrowing over the next two years to build shared housing and schools. Speaking at 10 Downing Street, Cameron also praised the “ambitious and laudable plan to rid” Belfast of its almost 41 peace walls and gates. However, there was disappointment at the ongoing indecision by the British government over the issue of corporation tax. The Primer Minister added that the ambitious package would help strengthen the foundations for peace and send a positive message ahead of the G8 summit at Lough Erne. The Taoiseach, Enda Kenny welcomed the Northern Ireland Economic Package and said the “initiatives are important milestone developments in delivering the forward-looking, prosperous and reconciled society we all wish to see in Northern Ireland”. He added that it sends a very strong message “that Northern Ireland is open for business, while also tackling divisions within the community”. Email “Cameron announces economic stimulus package for Northern Ireland”. Feedback on “Cameron announces economic stimulus package for Northern Ireland”.